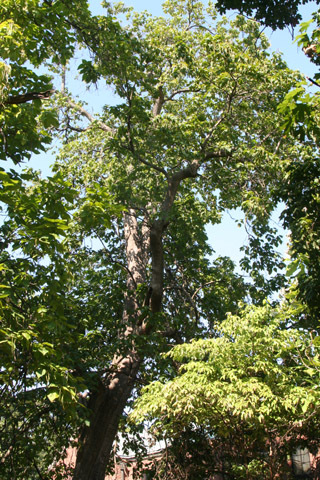 Located between the Divinity School and Garland Hall, this is the biggest catalpa tree in the arboretum, with a diameter of 111 cm (44 in. ), height of 18 m (60 ft), and crown spread of 16 m (52 ft.). Catalpas are noteworthy for their showy white flowers in the spring, and long, thin fruits that form in the summer and persist throughout the winter. On this particular tree, there are numerous rows of sapsucker holes, made by a woodpecker that returns to the holes it pecks to lick the sap and any insects that are stuck in it. Sapsucker holes are not particular to catalpa trees - who knows why the bird chose this particlar tree for its holes? This organism is a living specimen that is part of the  Vanderbilt University Arboretum  with the local identifier 2-182.